LAS VEGAS, June 4, 2018 /PRNewswire/ -- LG Electronics USA Business Solutions is unveiling a new LED display with unparalleled installation capabilities – the LG Transparent Color LED film display. Making its introduction for the first time in the United States this week at InfoComm 2018, the revolutionary display has the ability to turn any window or glass surface into a customizable digital canvas. Building on the success of LG's highly-acclaimed gray-scale Transparent LED film display introduced at InfoComm 2017, the new Transparent Color LED film (LAT240DT1) display offers eye-catching digital content and information in color while interacting seamlessly with its surrounding environment. 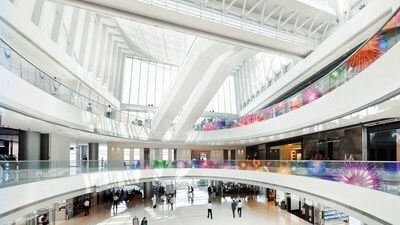 The versatile color LED film offers more than 1,000 nits of brightness, with each 668x480 mm panel containing 560 LED pixels that support a wide range of color while maintaining a high transparency ratio that displays compelling content in vivid colors while still showcasing what's behind the glass. "The LG Transparent Color LED film display exemplifies how LG continues to move the digital signage industry forward by offering unparalleled impact and versatility," said Clark Brown, Vice President, Digital Signage, LG Electronics USA Business Solutions. "Next-generation display solutions like this blend seamlessly into surrounding environments for a limitless range of installation possibilities." At just 1.5mm thin, the LG Transparent Color LED film delivers a wide range of colors on the 24 mm pixel pitch display. It is easy to install (requiring minimal construction) on any existing glass surface using its self-adhesive transparent film. While maintaining high transparency, the LED film can display pictures, animation and videos with various color combinations, making it ideal for indoor and window-facing areas with large glass surfaces such as retail storefront windows. Other applications include mass transit rail platforms and safety barriers, where LG Transparent Color LED film can display digital content and information, and lobbies and large public areas where it can convert ordinary glass into stunning, eye-catching digital signage displays. Even tall glass elevator shafts can be transformed into stunning pillars of graphics and light. The flexible display also works on a wide range of curved glass and window surfaces with curved format support up to 1,100R concave and in parallel to the bezel, can be cut to size, truly converting any area of ordinary glass into a dazzling, state-of-the-art digital display. Visitors to LG's booth at InfoComm 2018 in Las Vegas (June 6-8, Las Vegas Convention Center, Central Hall, Booth #2546) will be able to experience LG's full lineup of digital displays in addition to the new LG Transparent Color LED Film display. For more information, please visit www.lgsolutions.com. The LG Electronics USA Business Solutions division serves commercial display customers in the U.S. lodging and hospitality, digital signage, systems integration, healthcare, education, government and industrial markets. Based in Lincolnshire, Ill., with its dedicated engineering and customer support team, LG Electronics USA Business Solutions delivers business-to-business technology solutions tailored to the particular needs of business environments. LG Electronics USA Inc., based in Englewood Cliffs, N.J., is the North American subsidiary of LG Electronics Inc., a $55 billion global force in consumer electronics, mobile communications, home appliances and air solutions. LG is a 2018 ENERGY STAR® Partner of the Year-Sustained Excellence. For more information, please visit www.LGSolutions.com.